The USS Turner Joy is due for a more-than $1 million renovation next year, so her underbelly can be scrubbed and painted. But what about the little shop that fronts the mighty Vietnam-era destroyer? Mick Hersey, a veteran and Kitsap County’s inexhaustible historical memorial preservationist, thought about a revamp of the shop about three years ago. It took a bit longer than he thought it would, with the sign erected on the shop the day of the ribbon-cutting Wednesday. “What I thought was a four day work project finished 30 minutes ago,” Hersey said before a gathered crowd of dignitaries. Here’s what’s impressive: Hersey pulled together different Navy-related groups and once again got help from Lowe’s Home Improvement stores, who’d partnered with him in the past on projects like attaining new American flags for military memorials here. In total, 105 volunteers contributed, with Lowe’s picking up the approximately $3,000 tab for siding and paint. Robert Parker, a Port Orchard resident who often volunteers for civic projects, was singled out at the ribbon cutting for his technical know-how in getting the project over the hump. 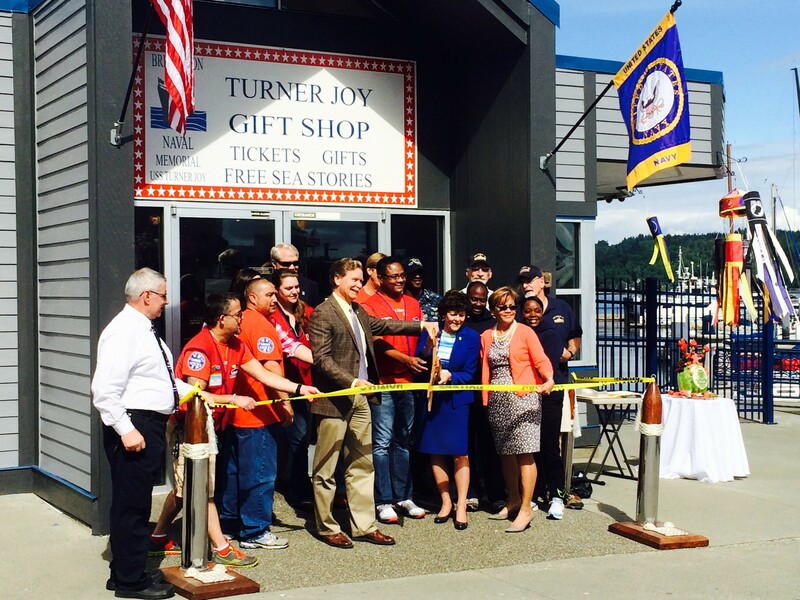 As for that trip to dry dock through Lake Union for the Turner Joy, stay tuned. The Bremerton Historic Ships Association has about $200,000 for the effort at this point, but will need more to make it happen. Robert let me be the first to simply recognize you as someone who wants to help and often does so for the community with your hours of participation. Period. That’s it. And a big thank you to all of the volunteers and material contributors on this wonderful job. It is unfortunate that so many individuals in public positions feel so threatened by you that your geographical residence has to be publicly thrown back in your face and you are constantly reminded that you’re the “tourist” that does not live here (in Bremerton) any time you are involved on this side of the water. I don’t see any of the other volunteers residences being singled out as often as yours is. In fact it should be pointed out that you don’t live in Port Orchard, you live in the county. So does the other primary organizer that is mentioned in this story. Pretty sure he lives in the county too. Now the media is even picking it up. Like where you live somehow matters or needs to be an asterisk on the good things you are doing for our community. Let the coat-tail riders who did not lift a finger have their 5 minutes at the site for their ribbon cutting photo opps. It only makes them look like the self-promotional fools that they are. Colleen, I also do not live in Bremerton City Limits, but in Kitsap County as well. When People ask where I live though, my address is Bremerton. We all are residence of this area whether we claim to be in the cities that make up Kitsap County or live in the county itself. When I coordinate the restoration of memorials, I do not care where the volunteers come form as long as they are willing to help. Preservation and restoration of Memorials, buildings and monuments is an ongoing project that all need to work on to maintain. When asked why I do this, well I ask why not. If not me then who will step up!! It seems where you live is more important than what you do. For elections in a specific area, locations are important. For living, working, recreating, spending, and improving Kitsap County it should not matter where you live. Thank you to Mr. Parker & Mr. Hersey on their efforts and contributions. Now if politicians only understood we are all in this together and partisanship & location should have little to do with us improving Kitsap County for everyone maybe even more could be accomplished.